The Resource Directory provides an online link between an agency, approved service providers and the general public. This empowers your clients, makes communication easier, saves time, and creates more efficient overall workflow. The Provider Portal enables providers to maintain their own information, view authorizations, and communicate with the agency. 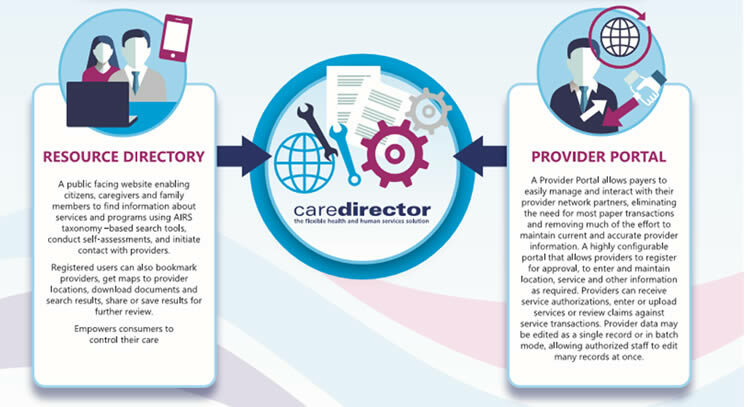 No data resides on the portals; all security, data and audit trails for the portals are managed within CareDirector. The Resource Directory allows members of the public to find and initiate contact with providers who offer the services they need, in their desired geographic area. The Consumer Portal option includes the same resource search and advocacy features, with additional configurable options for registered clients. With either option, the agency can determine what information is available, and the level of access granted to users. Public users can print, e-mail or export their search results. Registered users can save searches, communicate with their care team, and optionally designate advocates; other individuals with access to their online record. Supports consumer self-service, empowers clients, saves the agency time, and makes workflow more efficient. Enhances client and family involvement; registered users can securely view their care plan, service authorizations and upcoming appointments, save searches and designate advocates. Frees up agency staff time, and facilitates secure communication between the agency, providers and consumers. Supports self-directed and family-directed services. The Provider Portal enables providers to view and maintain their own organizational information within CareDirector, with optional agency oversight and approval. Agency staff control individual provider staff access, and overall view or view/edit access to the provider detail available on the Portal. Providers may also view their active service authorizations, upload documents and files, and communicate with the agency. The Provider Portal facilitates provider self-service. Authorized provider staff can securely view and/or manage organizational, program and staff detail information, view service authorizations, and upload documents and other files. Helping to put consumers in the center of care and decision making, the Consumer Portal allows secure login, the viewing of case plans in CareDirector, secure communication with care coordinators and more.